Virginia Beach Friends School has long been known for its commitment to the arts. Since the School’s inception in 1955, the arts in all ways, shapes, and forms have been fostered in each child’s Friends educational experience. This past December, I had the privilege of sitting down with one such VBFS artist and alumnus, Ellen Sinclair. Ellen is a well-known Hampton Roads artist best known for painting the poster for the 2018 Neptune Festival, a poster that celebrates the heritage of the city of Virginia Beach but has a distinctive flare that varies from past posters highlighting Ellen’s artistic style. Ellen and I began by discussing her achievements within the art community, as well as her time at Virginia Beach Friends School. Ellen attended VBFS from Kindergarten to the 7th grade, the only grades Friends offered in 1958. Ellen was very clear to share how different her Friends campus was versus the one that currently exists today. “During those early years, the campus looked much less developed. Only the Meeting House, the Fox and Woolman buildings stood at that time.” Her reflection on the then and now campus differences led to vivid memories of playing hopscotch under the breezeway and the realization of how much larger the buildings felt to her as a child. When asked about where her passion for art began, Ellen shared that she always had a passion for art but felt that Friends further fostered this passion through the School’s nurturing atmosphere. Ellen recalled a memory where she was called into the principal’s office, who at the time was Louise Wilson, the founder of Virginia Beach Friends School. Ellen had been called into her office after laughing during Meeting for Worship. Expecting to be reprimanded for her disruption, Louise reminded Ellen about how we all have to be respectful for everyone’s quiet. What Ellen remembered most about the experience was that Louise asked her to spell principal. After spelling the word, Louise then asked her what the last three letters spelled out leaving Ellen to ponder the meaning of Louise’s question on her own. Ellen majored in studio art and art history in college and even spent a year abroad studying art in Paris. 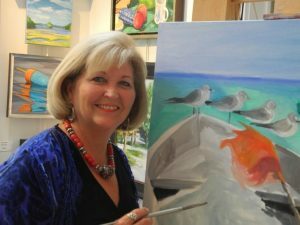 Today, Ellen continues to foster art in Virginia Beach by serving on the board for the public arts of Virginia Beach. Ellen was a member of the group that raised private funds for the canoe sculpture that is shaped like a star on the newly constructed Lesner Bridge on Shore Drive. During my time with Ellen, I observed in her what I see in so many VBFS alumni I know today. Virginia Beach Friends School instills a sense of community in everyone who attends the School, regardless of how long or when they attended. Community is one of the Quaker values that the School strives to teach every single student whether they attend for just one year or end up as graduates. Thank you, Friends! If you are interested in Ellen’s art work, please visit her website or you can email her as well.